India is the World’s largest democracy. The Indian election 0f 2014 was alone the largest election in the history of mankind. According to the stats, it had 814, 500,000 voters, 930,000 polling stations and an insane amount of money spent on it. The story told in Newton is concentrated on the 74 voters in the jungle of Chhattisgarh, where the citizens are fearful of an attack by Maoist rebels. On top of that, they don’t even know who to vote for… but as long as they cast their ballots, it seems is what matters for the society most…. 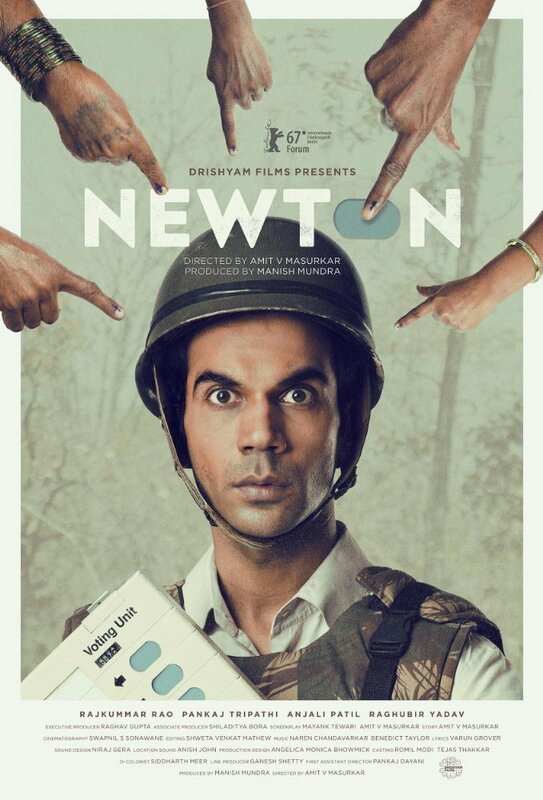 Rajkummar Rao as Nutan, or how he called himself as Newton, holds a Masters in Physics. He is an educated, principled and honest young man. He refuses to marry an educated woman and wants nothing to do with anything that goes against his vision of perfect life. Well, he is assigned to be as an election officer and sent to the place many would and did refuse to go – in a jungle in the state of Chhattisgarh where its citizen are fearful of the presence of Maoist rebels. While a young man needs to secure all seventy-four ballots, he has to show his persistence with Atma Singh, the head of security at the polling booth. As the election day fast approaches, all of them will have their reasons to leave the dangerous jungle, while the only man who will stay there until the clock turns 3 PM is Newton – the most idealistic man on Earth. As the story unfolds, you see the reality of election system and its sense that no longer appears logical. When the citizens were asked what is that they need from their leadership, they were not sure what to say, but when the answer comes, you swiftly realize how little people need to satisfy their daily needs. But sometimes even to get that can also be difficult. Newton directed by Amit V Masurkar is poignant, an honest and uncompromising look into the election system. It’s a dark comedy where sometimes you don’t even want to laugh at all. Through its humour, he tackles what needs to be said about the importance of election and it being useless. Its smart approach makes it even better, and for you, my dear reader, much more educational than you can imagine.